Gaynor Dickeson Dip SBA(Dist), FCPGFS, ASBA, SBA, is a distinguished and award winning botanical artist with pictures in collections around the world. With two Royal Horticultural Society (RHS) awards for her Magnolia x soulangeana series in watercolour and ‘Small is beautiful’ series of crab apple paintings in coloured pencil, Gaynor is now working on her next series of paintings for the RHS with a view to exhibiting them in 2019. Gaynor has won similar accolades in other countries and feels honoured to have work in the Hunt Institute for Botanical Documentation in Pittsburgh, USA. Her work can be found in collections worldwide and in the UK at Cumberland Lodge, Great Windsor Park and Chelsea Physic Garden. In 2017 Gaynor exhibited in the city of New York, USA and her work was in a travelling exhibition throughout the United States over three-year period. She does of course exhibit nearer home and has taken part in exhibitions in London, Germany and Norway. One often reads about artists who say they have always been able to do draw and paint – but it was not the case for Gaynor. As a child she desperately wanted to draw like some of her friends and so practiced and practiced. Her philosophy is not based on having an innate ability to draw, but on really ‘wanting’ to do so. Originally leaning towards ornithology, Gaynor continued to develop her drawing, painting and teaching skills during the 25 years she lived in Norway. The resulting pictures were a culmination of her research into the detail of the birds through watching, sketching and photographing them in their natural habitat. She was also supported by Stavanger Museum who loaned her bird skins from their precious collection. However, after moving back to the UK, those connections were lost and she turned to other subjects to immortalise. England is known for its gardens and plants, and as gardening had always been important to Gaynor, it was very natural to turn to painting her plants. This lead to her very deep interest in botanical art. The highly detailed paintings are created using coloured pencils, watercolours, pen and ink or graphite. But always, Gaynor feels she wants to dig deeper into the heart of the plant she is depicting. To this end she often turns to a microscope to find the hidden treasures and magnificent colours trapped inside. This fascination for detail started with a magnolia seed when painting the Magnolia x soulangeana series. The seed hung from the fruit with a fine thread. Gaynor wondered what the thread was and where it came from, so dissected the seed. Many of her paintings include dissections, making these attractive for use in Florilegia. 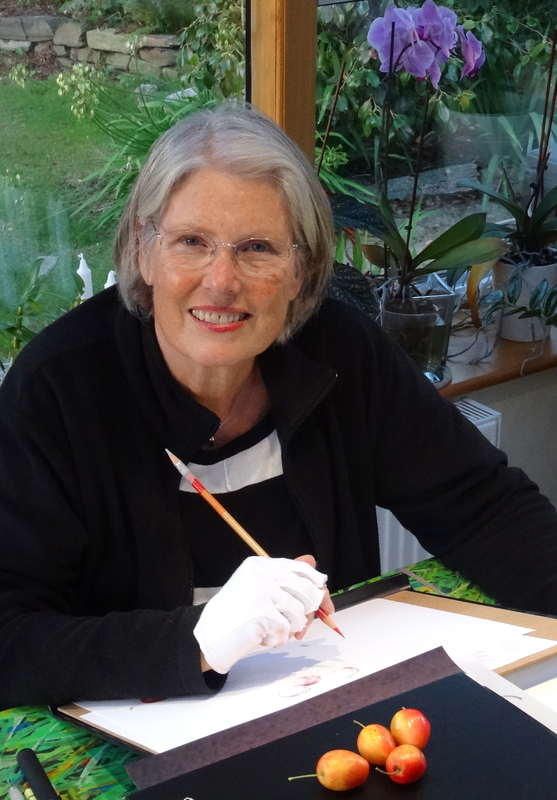 As the years have gone by more artists have wanted to learn her techniques, therefore Gaynor has become a popular tutor both in the UK and abroad. In recent years she has been asked to hold workshops in the US at the American Society of Botanical Artists conferences, in Norway, and France. But after having been asked to write an online botanical art course her students are now based worldwide. Gaynor accepts commissions, sells original artworks, limited edition gicleé prints and cards. She also thoroughly enjoys teaching local weekly botanical art classes and monthly workshops . Her students tell her that after going to one of her classes, workshops or online course, they look at everything with different eyes; seeing detail they never saw before. How wonderful! Tusen takk Magny. Jeg er så glad at du liker arbeidet mitt og velkommen skal du være med å følge bloggen.